Silent Disco or Silent Party equipment consists of headphones and transmitters. At a ‘silent’ event, guests wear headphones and listen to whatever is being played through them. Our Silent Disco equipment has 3 channels; this allows guests to switch between 3 sources while wearing one pair of headphones. Silent Disco has been around for a while, however @ Capacity revolutionizing it. By using mixed media, and incorporating a “silent” aspect to everyday events we take the experience to the next level an event doesn’t have to be loud for you to have a great time! Releasing a new album? Launching a video? Viewing a documentary? Your guests won’t stop talking about their unique experience with Silent Disco equipment provided by @ CAPACITY. Take a step away from the ordinary, play two songs and a video that shows your creation process simultaneously! Having trouble balancing the acoustics for an outdoor movie? Maybe you would rather not deal with the “setup” and “break-down” of audio equipment, especially when the weather is unpredictable. @ CAPACITY offers a no-hassle solution to improve sound quality and make sure every patron enjoys the cinematic experience. Your guests come to the show to see new styles and trends. However, the party must go on! Don’t compromise have music, or an MC, or videos, or slideshows, or DJ’s, or an announcer… well you get the point. All playing simultaneously, that will get your guests attention. Corporate event? The possibilities are endless. Play a slide show of your companies annual achievements, have your guests tune in to a live presenter for instructions and prize giveaways. Record a video montage of employees thanking co-workers, and motivating each other, and don’t forget about the DJ. Silent Disco equipment is great for all types of festivals. 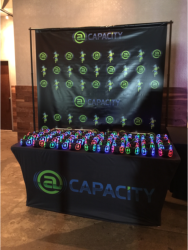 Whether you’re having the event outdoors to accommodate a larger crowd, or an intimate indoor gathering, you should definitely consider @ CAPACITY. We have enough equipment to meet your needs. Don’t worry about the neighbors, we’ll take care of that. Boat docks, roof tops, and residential areas, are some of the areas that have noise ordinances. The only people that hear the music are the people wearing headphones. That will keep your party going, and going, and going…..Silent Disco powered by @ CAPACITY. How can a party or social event be “silent” ? A SILENT DISCO is an event where people dance to music, much like any other party or similar event. However, at a silent disco/party this music is listened to through wireless headphones…. Rather than using a traditional speaker system, music is broadcast from a small transmitter, the signal is picked up by the wireless headphones worn by the participants. 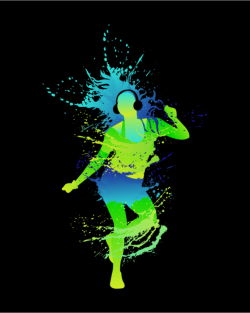 Those without the headphones hear no music, giving the effect of a room full of people dancing to nothing! 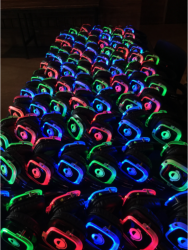 We offer Silent Disco equipment, this is one of the ways we can fill your next event to CAPACITY! Each pair of headphones has 3 channels. This means, the person wearing the headphones has 3 options. The headphones have LED lights that indicate which channel the wearer is listening to. It’s like 3 parties at once! 3 awesome DJ’s spinning at the same party at the same time. Whatever you choose, options and combinations are limitless!!! Why would a person want to party with headphones on? Because it gives every person attending the event the benefit of controlling their own experience. Not only volume, and channel control, you can take the headphones off and hold a conversation while in the middle of a ‘ROCKIN’ party . When you decide to continue partying… put the headphones back on and ‘ROCK OUT’ now that’s cool. What equipment does @CAPACITY provide? We provide the Headphones (units), the transmitters, and all the wiring components necessary to connect our transmitters to a power source. Our equipment connects to standard DJ equipment, your DJ,s will need all of their normal equipment. The DJ equipment will then be connected to our transmitters instead of speakers. Do I need 3 DJ’s? 1, 2, or 3 DJ’s. 2 DJ’s and 1 MP3 player. 1 DJ, an MP3 player, and a television channel. There are many possibilities. For example, if there are only 2 DJ’s the third channel will be silent. Yes, the units have an on/off switch, a volume control, and another switch to select the desired channel. We setup a table near the entry of the event and explain the function to each person it takes approximately 8-15 seconds per person on average. How are the units secured while in use? We have a booklet that stores ID cards, the guests are given a card in return similar to a coat check system. In situations where the guests may not have ID cards, the event must have controlled access, this can be costly as more staff is needed and a refundable security deposit is required. The headphones do not have exposed electrical parts. However, the headphones can not be exposed to liquid. Please make sure you have a “rain date” or tent for contingency if your event is outdoor. Will the headphones be safe and clean? Yes, We deliver clean, sanitized, fully charged units to every event. at the end of the event we collect the units and take them to our warehouse. There they are cleaned, sanitized, charged, and folded to be stored for the next event. The containers used for transport and storage and cleaned and sanitized in-between as well. The units will arrive at your event fully charged, the charge will last for 10-12 hours of play. Is there a minimum rental quantity? Yes, we aim to be as affordable as possible but there are cost involved that cannot be avoided. Cleaning, travel, transport, storage, etc…. minimum rental quantity is 100 units. Keep in mind price decreases when quantity rented increases. Rental costs will be between $7.00-13.00 usd per unit. with the lowest prices reserved for schools and non-profit organizations. Every event will require a custom price quote for exact price. Pricing is based on the quantity of units rented, travel/delivery expenses, and type of security provided for the units. Our prices are competitive, and we stand by our products and services, we guarantee clean, reliable, quality service. Don’t put your event in the hands of amateurs to save a buck.